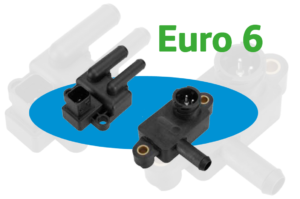 Following my latest post about pressure measuring at the particulate filter, I would like to talk specifically about Euro 6 today. To meet the requirements and to achieve a reduction in nitrogen oxides, we need another catalyst behind the particulate filter. This approach will increase the technical requirements and results a need for differential pressure sensors. The new situation will impact mostly the particulate filter load detection. We need to measure the dynamic pressure, and also the absolute pressure behind the filter, to determine the pressure drop across the filter system. With the Euro 6 standard this is achieved using differential pressure sensors. The simplest method of measuring the differential pressure between p1 and p2 is to place a pressure-sensitive membrane between these two pressures so that p1 rests on one side and p2 on the other. The generated signal directly reflects the difference between the two pressures. To examine its pressure, the exhaust gas is led via hose lines directly to the pressure cell. This exhaust gas contains compounds such as sulphuric acid and other aggressive substances. These materials can destroy the electronics on the pressure membrane and render the differential pressure sensor unusable. 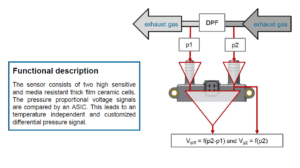 In low cost sensors with only one cell, the membrane is protected from the exhaust components by a gel. Unfortunately, this gel is not stable over the entire desired lifetime of the membrane and gradually loses its protective effect. The result is reduced life of the differential pressure sensor. In order to counteract this effectively, we use ceramic pressure cells which come into contact with the exhaust gas only from the side without a printed measuring structure. Additional protection is not necessary here. With this two cell pressure measurement technology, we have succeeded in developing an unbeatably robust, durable and still very accurate differential pressure sensor. These outstanding properties make this sensor especially useful in the commercial vehicle sector. With this differential pressure sensor, we can provide additional added value for the user. Since p1 and p2 can be measured independently of each other, the actual system pressure before or after the filter can be output as a stand-alone signal beside the differential signal. If you like some more information about our wide portfolio for exhaust systems, open the complete overview here! You want to know more about our company? Sign our newsletter here!